Born on the 13th of September 1965, Sorina Pintea is by profession an economist, with experience in the field of healthcare, as well as business management, public administration, project management and consultancy. She has lived, worked and studied in the north of Romania until 2017. 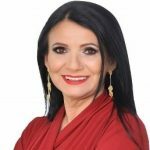 She holds a degree in economy from Babes-Bolyai University in Cluj-Napoca, and has trained in various complementary fields including business administration, public administration, project management and hospital management. Her entire professional career was built on her strong economic abilities, and she was a consultant, director, manager and has developed projects that many have deemed unsalvageable. She was manager of the Pneumophtisology Hospital Dr. Nicolae Rusdea Baia Mare for four years with very good results, which encouraged her to take on a bigger challenge, that of managing the Emergency County Hospital Dr. Constantin Opris Baia Mare. Her management skills were widely recognized in the community, as she managed to boost investment, raise salaries and raise the profit of the hospital. In 2017, on the Romanian Army Day, Ms. Pintea was awarded Honorary Membership in the Commander’s Grade by the Military Order, for her dedication and results in the healthcare field. Ms. Pintea has been a member of the Social Democratic Party since 2009, and was elected senator in the 26 Maramures constituency in December 2016. She was a member of the committee on labor, family and social protection and vice chair of the commission for the investigation of abuse, combating corruption and petitions. In early 2017 she resigned from the senator office in favor of continuing her work in the aforementioned hospital. In January 2018 she became the Minister of Health. Ms. Pintea is married and has three children. Besides Romanian, she speaks English, Italian and Russian. Tiberius is a graduate of the University of Medicine and Pharmacy of Iași, Gr.T.Popa, primary medicine emergency psysician. 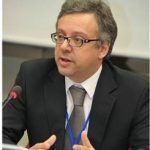 From Augist 2017 to November 2018, Tiberius served as Undersecretary of State in the Ministry of Health coordinating activity of the Employership and Trade Units Division, the work of the Operațional Center fo Emergency Situation and is a member of the working group for the elaboration of the Law of Health Professions. 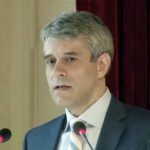 By a decision of the Prime Minister published on Wednesday, November 28, 2018, Tiberius-Marius Brădățan was released from the post of Undersecretary of State at the Ministy of Health and was promoted to the post of Secretary of State at the same ministry. A graduate in chemistry and pharmaceutical technology, Mr. Seychell specializsed in Chemical analysis. He has held important positions on several government boards and commissions in Malta, including the Food Safety Commission and the Pesticides Board. Mr Seychell occupied the post of Head of Directorate at the Malta Standards Authority between 2001 and 2006. He has been responsible for the implementation of a number of EU directives in the areas of risk assessment, food safety, chemicals and cosmetic products legislation. Additionally, he has actively participated in negotiations on major technical proposals such as the new chemicals legislation, REACH, and in screening processes in the areas of free movement of goods, environment and agriculture during the process leading to Malta’s accession to the EU. He held the post of Director of Environment in Malta between 2006 and 2011. As Director, he was responsible for a broad range of functions arising from the Maltese Environment Protection Act. He was appointed Deputy Director General for Health and Consumers at the European Commission in March 2011. Additionally, he is responsible for directorates dealing with Consumer affairs, Public health and Health systems and products (SANCO). 2014 – to date: Deputy Director-General for Health in the Health and Food Safety Directorate-General (SANTE). Dr. Rokas Navickas is a highly accomplished Physician and Organisation Leader with international training and global experience that reflects achievements across healthcare, wellness sector, research and education of Cardiology initiatives. Dr. Rokas Navickas is the Scientific Coordinator and Executive Board member at CHRODIS PLUS, a joint action between EU countries to reduce the burden of chronic diseases. Dr.Navickas coordinates and monitors the implementing work package leaders’ and promotes the necessary cooperation among them, establishing a common overall CHRODIS-PLUS methodological approach towards the general aim of implementing new or innovative policies and practices. Till 2018 Navickas was also a consultant cardiologist at Vilnius University Hospital, a position he has held since 2010. Prior to that he was a specialty trainee at King’s College Hospital NHS Foundation Trust from 2008 and 2010, as well as a foundation trainee at Oxford University Hospital NHS Trust. Navickas has also been a board member of Lithuanian Heart Association. 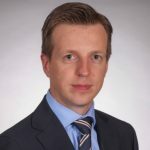 In addition, he is a fellow at the European Society of Cardiology and a member of the Lithuanian Hypertension Association. R.Navickas received his MD from the Vilnius University Medical Faculty, including elective studies in cardiology at Oxford University. In 2016 he received a Ph.D. from Vilnius University. Currently improves his knowledge at the London School of Economics and Political Science (LSE) as Executive Master of Science – EMSc, Health Economics, Outcomes and Management in Cardiovascular diseases. Mikel Irujo Amezaga. PhD in European Law, he worked in Thomson Reuters, world’s leading source of legal intelligent information, from 1996 to 2015. After two periods of leave to work in the European Parliament (1999-2002 as assistant and 2007-2009 as MEP), he went back to the company in 2009, being responsible of the EU Procurement and Programmers Unit. 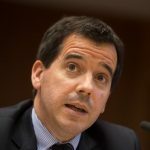 In September 2015, he is appointed as the Head of the Navarra Delegation in Brussels. He has been the rapporteur on two Committee of the Regions opinions on Smart Specialisation Strategies (RIS3) and inter-regional cooperation and, secondly, Strengthening Innovation in Europe’s Regions: Strategies for resilient, inclusive and sustainable growth. Currently Navarra is leading the Partnership “Social economy to foster industrialisation” under the call of thematic platforms for industrial modernisation (DG Regio). He is the coordinator for the thematic platform partnership on social economy. Earlier Professor Laatikainen was a Director of the Department of Chronic Disease Prevention at the National Institute for Health and Welfare (THL) from 2009 to 2012 and a Head of Chronic Disease Prevention Unit (2005-2008) in the National Public Health Institute (KTL). She has had an affiliation to KTL as a researcher since her graduation in the Medical Faculty of the University of Helsinki in 1996. In 2004, Professor Laatikainen worked as a senior lecturer in the Greater Green Triangle University Department of Rural Health (Deakin and Flinders Universities) in Warrnambool, Victoria, Australia. 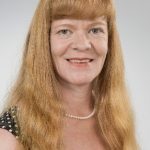 Professor Laatikainen’s research and expert functions have concerned mainly epidemiology and prevention of main public health problems such as cardiovascular diseases, diabetes, memory disorders, asthma and allergy. She has coordinated several large population based surveys nationally and internationally and has been closely involved in the national and international working groups developing methodology of health monitoring. She has also long-term expertise in developing and conducting evidence-based lifestyle interventions. She has over 300 peer reviewed research papers. Professor Laatikainen has, internationally and domestically, served in a number of scientific, expert and public health functions, WHO’s work and multinational projects. She has since 2002 coordinated the work of the WHO Collaborating Centre for Non-Communicable Disease Prevention, Health Promotion and Monitoring in Finland. Karsten Uno Petersen is a regional council member of the Social Democratic Party (S) in the Region of Southern Denmark, where he is chairman of the Innovation Committee, Vice-Chairman of the Committee for Regional Development and a member of their Executive Committee. He is also a member of the European Committee of the Regions in Brussels and other European health organizations. 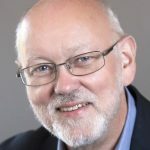 Karsten Uno started his political career in 1993, became county councilor of Ribe County Council, and he has been a regional council member since 2005. Besides being a regional council member, he is the director of the company LiveAid. 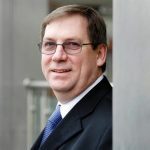 Jon Barrick is the President of the Stroke Alliance for Europe, a coalition of Stroke Support Organisations, as well as a Board member of the World Stroke Organisation and Chairman of the WSO World Stroke Campaign. Both his Mother and Father had strokes. Until July 2016 he was Chief Executive of the Stroke Association, the UK wide charity dealing with all aspects of stroke. In 12 years in that post the charity grew threefold, providing over 350 services at local level to stroke survivors and their families, with over 450 affiliated stroke clubs and long term support groups throughout the country. Jon has been made a lifetime Vice President of the Stroke Association. Jon played a key role in ensuring the development of the National Stroke Strategy in England. This model of stroke support organisations, informed by stroke survivors wishes, has been advanced by sharing this concept to other countries. Jon helped to build a coalition of Stroke Patient organisations across Europe from 7 organisations to 32. In time, it is hoped that each of these stroke support organisations will grow in their own way to advance the cause of stroke survivors, stroke research and better support in each of their countries. Previously Jon was UK Director of Community Services for 15 years at the Royal National Institute of the Blind, and chaired the committee on Aging and Blindness for the World Blind Union where he gathered his expertise in the governance of international voluntary sector activity. 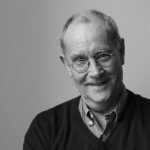 He has been Trustee with a host of various organisations in the past including jointly chairing the British Neurological Alliance of over 50 neurological charities, and being a Trustee of the Association of Medical Research Charities (over 150 charities researching medical conditions). Jon himself appeared in the top 5 ranking of Britain’s most admired Charity CEO’s in 2006 and 2013.
cerebrovascular diseases at the University Medical Center in Utrecht, the Netherlands. He has been (co-) Chief Investigator of the randomised clinical trials HAMLET, PAIS, COOLIST, and VAST and is (co-)Chief Investigator of PRECIOUS, APACHE-AF, and MR ASAP. He is a member of the recently founded Dutch CONTRAST consortium which aims to identify and test new treatments for patients with acute ischaemic stroke or intracerebral haemorrhage through a range of follow-up trials to MR CLEAN. He is President of the European Stroke Organisation (ESO). Three years of preclinical work in the 1990s have aroused his interest in the translation of findings from animal stroke studies to clinical trials, which he aims to improve together with other members of CAMARADES. Prof Bo Norrving is professor in neurology at Lund University, Sweden. Bo Norrving is a founding member and past vice-president of the ESO. 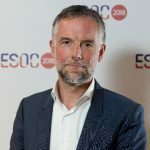 He had key positions in the Helsingborg declarations on stroke care in Europe, and he chaired the ESO European Action Plan for Stroke 2018-30 steering committee. He was the President of the World Stroke Organization (WSO) 2008-2012 and continues to chair the WSO Global Policy Committee and representing stroke at the WHO and the UN. He chaired the stroke group at WHO for the ICD 11 revision. Bo Norrving has authored >500 publications including several seminal papers e.g. the Swedish Aspirin Low Dose Study, and the world’s largest study of stroke in the young. He is a founder of Riksstroke, the world’s 1st national stroke registry. He has received numerous awards including the AHA/ASA Sherman award for life time achievements in stroke. Sorin Tuță, MD, PhD is Associated Professor at University of Medicine and Pharmacy Carol Davila, Bucharest. His medical activity as neurologist is currently taking place at the National Institute of Neurology and Neurovascular Diseases Bucharest, where he is a coordinator. Between 2006-2007, he was also the Medical Director of the National Institute of Neurology and Neurovascular Diseases Bucharest. His professional training in the stroke field include a European Master in Stroke Medicine (2007-2009), a degree programme organised by the European Stroke Organisation and endorsed by the World Stroke Organisation. 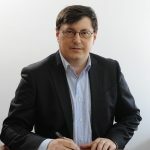 Dr Sorin Tuță has been a Member of the Neurology Committee of the Romanian Ministry of Health in 2013, and also Secretary of the Steering Committee of the “BrainLINC Journal”. He is the Vice-president of the Romanian National Stroke Association and was in charge with the organization of the Romanian National Stroke Conference between 2016-2018. He was awarded with three national and one international awards for his scientific activity, especially in the stroke field. Dr Cristina Tiu graduated from the University of Medicine and Pharmacy “Carol Davila” in Bucharest, in 1987. She became a senior neurologist in 1997, senior lecturer in 2000 and associated professor in 2006. In 2012, she got a European Master of Sciences in Stroke Medicine (Danube University, Krems, Austria). She has spent 24 years in the Department of Neurology of the University Hospital Bucharest. Dr Tiu has a special interest in the field of cerebrovascular disorders, so she added neurosonology to her clinical and teaching activities, a field in which she organises a yearly teaching course.She is currently the coordinator of the Stroke Unit of the University Hospital Bucharest. 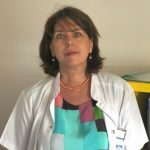 She is also the leader of the Working Group for Priority Action in Stroke created by the Romanian Ministry of Health, and has organized the national network for interventional treatment in stroke in the past two years. 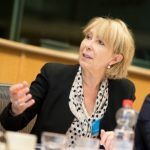 Grethe Lunde is a Board member of the Stroke Alliance for Europe. Grethe is from Stavanger, Norway. She has over 24 years of experience as a stroke survivor, both with and without wheels. 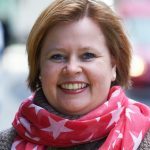 Grethe also has 20 years of experience in working for stroke organisations and providing peer support, giving speeches about her life as a stroke survivor and how to master a life after having a stroke. Cathy Smith is the founder of the Brussels communications company SpeakEasy. She specialises in conference moderating, media and crisis training all over Europe. Cathy worked for the BBC for many years as a reporter and presenter. She is a former Brussels-based correspondent for both the BBC and GMTV and was a main presenter of Channel Four News and ITN World News in the UK. She also fronted European Journal for DeutscheWelle TV from Brussels.